Do you desire a special place to eat breakfast outside? Spend time with the family in the afternoon? Host a party in the evening? This gazebo is certain to make a lasting impression on your guests as they enjoy your upscale, shaded getaway. It's sure to become the favoured place to relax, dine, and enjoy conversation.It's durable, stable and affordable. There is a built-in hook underneath the center of the canopy which is a great place to hang plants or outdoor lighting. 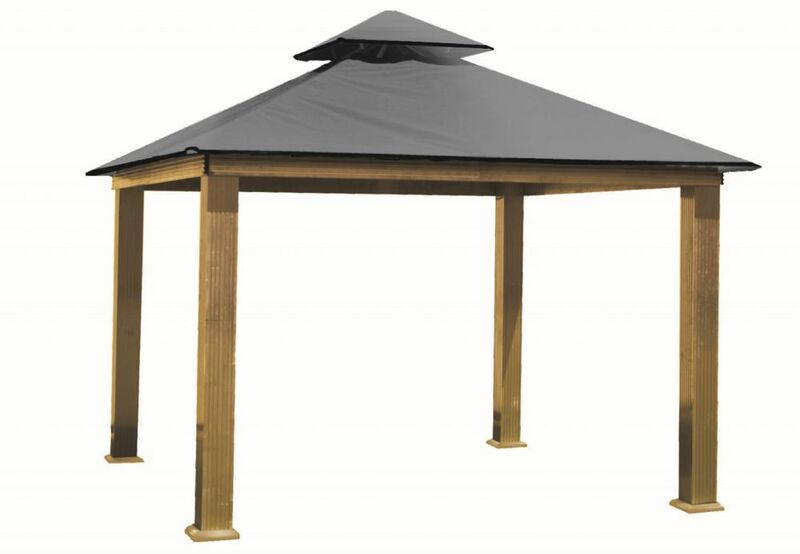 This magnificent looking gazebo will provide protection from harmful effects of the elements for seasons to come. You will appreciate escaping to the shady sanctuary in your own backyard, patio or pool area. Plus, the 12 feet x 10 feet footprint offers plenty of room to comfortably set up full dining or seating beneath, giving you flexibility, style and function. The Monaco Hexagonal gazebo provides the perfect outdoor lounging area. It's an all-season garden refuge. This modern gazebo creates a sense of privacy and provides a shaded and relaxing area for you and your guests to enjoy. Improve your backyard or garden by adding this roomy gathering space as a private getaway or family patio shelter. The Monaco Hexagonal gazebo is a solid, sturdy structure, made of high quality powder-coated dark grey aluminum. Virtually unbreakable polycarbonate roof panels with anti-UV treatment protect your patio furniture from the suns harmful impact. It's perfect for entertaining and celebrating special family events, dining or just relaxing. Enjoy the luxury of this gazebo in all kinds of weather! Versatile, timeless design with plenty of sun shade. Sturdy, safe, steel and aluminum construction with a durable, rust resistant, powder coated finish in white.Assembly required, manual included.10' x 12' footprint offers plenty of room; 12-month limited manufacturer's warranty. Vented, soft-top canopy provides better stability in windy conditions. Easy to clean, 100% polyester canopy. Stylish, convenient and functional. Perfect sun shade for your backyard. Polyethylene rattan is low-maintenance and durable. 14 ft. Sq. Gazebo -Storm Gray The ACACIA Gazebo program offers the enthusiast the ability to extend their covered living area. Our rust free Structural Extruded aluminum frame will last a lifetime. The Electrostatic finish makes the frame even more durable and attractive. The electrostatic finish actually sends an electric charge through the paint and the frame to help cause a chemical (ionic) bond, much stronger that simple powder coating commonly found in imported versions. From our quick assembly sculpted heavy-duty legs that can support over 1000 lbs. each to our unique frame design. We use Sun-DURA branded solution dyed polyester fabrics from Glen Raven Inc. Our factory precision laser cuts each of the canopy tops for the best fit. With 19 total colours available, we are sure that there is a colour to match your exterior and your needs. With a simple design, the canopy can be easily removed during winter months, extremely windy conditions, or for cleaning.